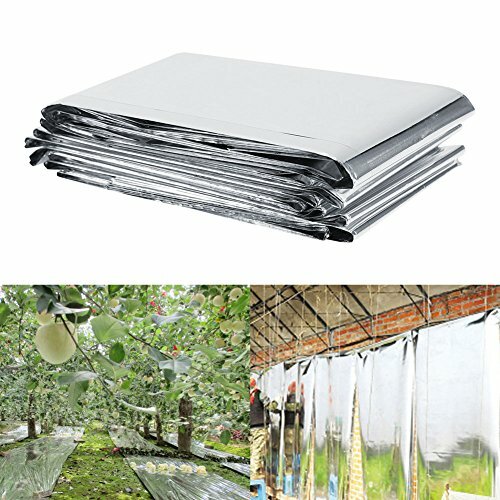 Our plant reflective film is adopting PETP film, eco-friendly, safe and healthy, and PETP film has excellent property of transmitting solar radiation. It can make the most efficient use of your lighting by reflecting light onto your plants, perfect for using in garden or greenhouse to increase plant growth. It is very easy to use, can be cut to meet different needs and can be folded to store easily. 【Fit for Greenhouse Plants】Making the most efficient use of your lighting by reflecting light onto your plants, perfect for using in garden or greenhouse to increase plant growth. 【Easy to Storage】Portable and lightweight, it also can be folded for convenient storage.Ideal for placing on wall, ceiling and floors of a growing area, in order to improve light reflection and distribution. 【High Quality】Our plants reflective film is adopting PETP film, eco-friendly, safe and healthy, and PETP film has excellent property of transmitting solar radiation. 【Can be Cut】It can be simply cut into different size to meet your needs, easy and convenient to use.